Much of what we post here has been designed to help people who have their online presence established. Online marketing, after all, requires an anchor to attach these efforts to, and that anchor is a website. Recently there have been a spate of comments about how to nail the website itself. With many asking, “how to create a website for my business”, we wanted to share our advice. People often periodically redesign their website to keep pace with the latest best practices, while others just entering the game want to get it right first time. Today, we’ll look at setting up a business website that can help new or existing enterprises gain credibility and target a wider market than ever before. Creating a website from scratch has several steps to it, some of which are practical and some of which are conceptual. Today, we’ll cover both these areas, and give you recommendations for best practice once your website is up and running, to help you make the most of the opportunity it gives you. So without further ado, I’m going to split the project up into three sections: pre-production, production, and post-production. This will help you get your infrastructure in place, then model the website itself, before populating it with content that will make users flock to your new presence. Before you start building a website, you need to decide what you want it to achieve. Some people use their website as an online business card – a reference point for essential information and little else. But a website can be so much, more. The modern website can be an encyclopedia of the business, a billboard, a PR machine, a store, a point of contact, and more. You need to establish your priorities for what you want your website to be, and set about making it a reality. Now you are clear that you need a website for a purpose, you need to gear up with the essentials. We will start with a Content Management System (CMS). Coding can take months, if not years to learn, and even longer to become sufficiently fluent as to design a website from scratch using only code. With HTML5, CSS and PHP, even just picking a language can be difficult. Rather than so, look to content management systems. These do all of the coding for you, by creating user interfaces that allow you to drag and drop elements, copy and paste content, and provide easy formatting options. There are several website builders available to help you do this. Wix offers several contemporary templates that can create a great first impression, categorized by the type of website and the businesses they are best suited to. These can be easily customized and populated with your own content and images. Weebly offers purpose driven website templates with drag and drop customization. These include portfolios, stores, business, personal, event and more. They offer dynamic features like background video and animated text, fade in effects and more. The websites are fully responsive, can host plugin e-commerce solutions, and even make marketing and analytics easier. While these are quick and easy, the best content management system is WordPress. Originally a blog host, WordPress has created one of the most versatile content management systems in the world, and 50% of all CMS hosted websites are now on their platform, and 28% of all websites. Best of all, it’s free, and there are thousands of high quality templates being designed to suit any business. With your decision made on a CMS, you will need a domain name, the address that will come to be associated with your website for its entire lifespan. Ideally, you want your domain name to mirror the name of your business as closely as possible. This is not always possible, and in the case of very long names, not always preferable either. If your company is called “Kitty and Lily’s Floristry and Cafe”, kittyandlilysfloristryandcafe.com just becomes a confused jumble of letters, almost impossible to spell right. Kittyandlilys.com might work, or even Kittylily.com. Try and make your URL as short as you can, while ensuring it is immediately identifiable with your business. If you haven’t yet named your business, then pick something short, snappy and distinctive. Make sure your name is something you can build a brand around. There are many extensions, but your best bet is to try for .com wherever you can. Once you’ve done this, you need to register your domain. You can do this through most web hosts, or independently through sites like Google Domains. This leaves you free to find the host with the best package and pricing, while allowing you to hunt down the best price for your domain independently. When it comes to hosting, there are a near-infinite number of web hosting providers out there. Web Hosting Secret Revealed gives you the best comparison reviews of the major providers, and goes into detail about their performance and features. Pro-tip: It’s worth remembering that if your site uses multimedia (which is an essential if you asked me), or if you expect high traffic(who doesn’t want a high traffic site? ), you should prepare for that with an appropriate high-speed, high-bandwidth hosting package on a server based in the same country as your primary target audience. Your website hosting is essential to creating a seamless experience for your users, which in turn will have a profound effect on your ability to convert them into leads, and then sales. Take time to review of the options and choose wisely. So, by now you should have your content management system, your URL, your hosting, and a template to use to define your website’s look and feel. It’s time to get down to work. Before creating your webpages haphazardly, create a structure and then populate that structure. It is very important, please allow me to repeat, it is very important, that you draw your site plan based on your defined goals. Says, if your site should act as an online business card, your site can be as simple as a 5 pagers that layout your business information and contacts. In case you are setting a website as an additional sales channels, please make sure to take into considerations e-commerce solutions and payment capability. So, let’s move on (with your goal in mind). When planning for the site, you want to split your content into sections, and make it as easily navigable as possible. Ideally, it should be possible to get to every part of your website, from any part of your website, in just three clicks. That means creating a site map that connects and themes all your content, so people can find what they’re looking for intuitively. If people want product information, they should be visiting a different area of the website to those seeking ideas from your blog. Depending on what team you’ve established, you can also consider creating landing pages – specific pages geared toward hooking in audience segments with specific needs and purchasing paths. Once you have established your site plan, broken down by landing pages, menus, sections, and pages, you can begin to populate it. Templates, design languages and content management systems are all well and good, but they’re no replacement for professional designers. Instead, getting these tools in place allows you to choose a specialist in working with the tools you’ve chosen to help you get the best results. Getting a web designer involved is an essential part of ensuring your website can make the best possible first impression. Getting a copywriter involved is another must. I can count on one hand the number of people who have the drive and ambition to conceptualise and launch a business, that can also articulate their messaging in a concise and compelling way. It’s also a good idea to have a graphic designer on hand, who can create custom elements and imagery for your website that reflects the brand, and engages visitors. Creating a team around you like this will give you the best chance to maximize engagement, and quickly establish an audience that can become your customer base. Make sure your design is simple, clear and easy to navigate. That counts on each individual page, as well as for your overall site. Make sure your text is easy to read – no cursive fonts, tiny writing sizes or jargon-filled walls of text. Make sure you leave enough white space to allow information to breathe and emphasize your key points to make sure they land in the mind of your audience. Use original imagery – stock photography is now easily identifiable and ruins a perfectly good design by making it look generic. This is also the reason why you want to have a graphic designer who can make original designs for your brand and your site. Responsive frameworks are a good way to split the difference, but mobile optimized sites are a must. Make sure you optimize your imagery and multimedia elements so they can load quickly even on a 4G signal. Accelerated Mobile Pages are increasingly popular for blog content, so try and build your blog with this architecture in mind. Multimedia is a must – video is taking over the internet, and there are simple and cost-effective ways to integrate video into your website. Do so in a meaningful way, not for its own sake – make sure every element you include adds value. Tell stories – testimonials are popular because positive case studies are a fast way to build trust. You can take this further – tell the story of your company, and tell the story of your products. That said, there’s a key trap most fall into when attempting this – in your company story, you are not the protagonist. Your customer is. Everything written must be written with your customer’s experience in mind. Personalization – with the above in mind, it’s always worth remembering that people sell to people. If you have a blog on your site, make sure the content is attributed to authors, who have roles in the company and a profile on the site. This is especially important if you are a service provider, as people will want to know what team they are working with. Creating your content with these principles in mind, you are now ready to launch your website! Congratulations. We’re now entering the final, and arguably most important process of creating a website – running, maintaining and optimizing it. If you want a great example of a beautifully designed, well balanced and compelling website, look no further than EXAGlobal Malaysia – the Hyper-Reality Entertainment Company using event management and theme park design, together with VR and augmented reality approaches to create immersive experiences that promise a world beyond reality. The MOST important thing for your website to stay sustainable and to be attracting high traffic, is to do Search Engine Optimization. If you don’t know about search engine optimization, it’s easy to learn. Hiring a web developer with SEO experience can save you a lot of trouble, but there are also many resources you can use to find out more about it (including this very blog). In a nutshell, SEO is the art of making your website discoverable to audiences seeking solutions to their own problems. By matching what you provide to what your audience is looking for, you can build up your traffic and increase the chance of making sales. There are plenty of websites out there sharing on this topics. To name a few MOZ, SEOPressor, Search Engine Watch. These website have good pieces of knowledge to get you kickstart/advance your website SEO. Next to doing SEO, the next thing you must not miss is to keep your website regularly updated. My first-timers make the mistake of thinking all the work it has taken to get it live and online has to be enough. In fact, this is just the beginning. Just to bring this up, regular updates will help with your website SEO too. In 2017, high quality content is king, and it takes a commitment to producing that content to succeed, whether through your own efforts or by hiring ghostwriters and sharing your strategic vision. Content provides real value, for free, to potential customers, helping you establish yourself as an authority in your field, building trust and respect, and creating an ongoing relationship. Make sure that as part of your website design process, you collect and analyse data. Try free tools like Google Analytics for your website. This will allow you to monitor your incoming traffic, find out where they are coming from, what content is most successful, how much time people spend on your site, and more. This will also help you identify how people are finding out about you, so you can target the best sources of traffic. Using data to inform how you evaluate and develop your website is the ONLY proven strategy for increasing your success online. By changing your approach in response to new information, you can iteratively build on your own success. Because a website is no longer a static object, but the hub of a growing community, it’s important to promote developments. You can use things like google AdWords to promote your site, as well as using services like PRWire Asia to announce the launch of your online venture to the world through hundreds of high authority news sites. You should also share all of your updates through social media channels like Facebook and Twitter, where you can build up a community of followers to engage with the site. By now, you shouldn’t be asking how to make a business website. You have all the tools, approaches and insights to be able to create your first business website. You also have a better understanding of a website as a constantly evolving expression of your business, and how to use analytics and optimization to develop and improve your first attempt. 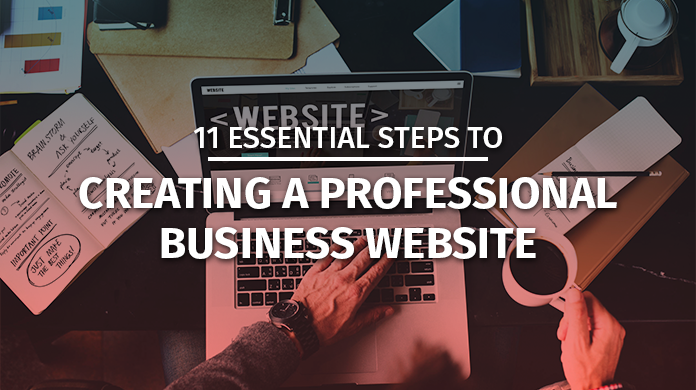 Have you learned valuable lessons from creating your first business website? Share them with our readers in the comments below!